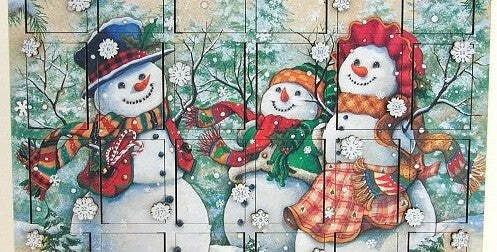 A tradition born in Germany, the Advent calendar has naturally become a favorite amongst children around the world. Not only do kids savor their tiny daily treat but the anticipation and suspense they experience as Christmas Day gets closer is palpable. This is in line with the whole experience of Advent which represents hope and anticipation. For the uninitiated Advent calendars are beautiful calendars with a Christmas picture behind every door, counting from the first door which is opened on December 1 to the last door opened on December 24 or 25th. Each day the child (or parent!) opens a new door until they reach Christmas, then there is often a set of double doors which traditionally have an image of baby Jesus laying in a manger. These days there is usually a chocolate behind every door with an extra big one for Christmas day. But in the past it was just pictures. The word Advent is derived from the Latin word for “coming” or “arrival” and all Advent celebrations are in joyful anticipation of the coming of the light, or Jesus or nowadays, Santa Claus. In the past Advent was also the beginning of the Christian church year. The traditional color of Advent is purple symbolizing the penitent spirit of Advent. Red and green are more secular colors of Christmas derived from older European practices of using evergreens and holly to symbolize ongoing life and the hope that Christ’s birth brings into the world. The first calendar is commonly believed to have been created in 1851. In German tradition the Advent calendar is part of the whole Advent celebration which runs throughout the month of December. An Advent wreath with four candles is lit on each of the four Sundays leading up to Christmas symbolizing enlightenment or the coming of the light with the birth of Jesus. Traditionally the candles are purple. The shift from the purple of the Season to pink or rose for the third Sunday Advent candles reflect a lessening emphasis on penitence in favor of the celebration of the season. The center candle in the wreath is white and is called the Christ Candle. It is lit on Christmas Eve or Christmas Day. The Sundays of Advent are family times regardless of faith or religion. Advent has become symbolic of the values we share within our families and it is a wonderful lead up to Christmas. Traditions can be created in homes around Christmas and Advent which may include putting up the Christmas tree on the first Advent, Christmas shopping on the second Advent; remaining decorations, baking and presents under the tree on the third and then of course, it’s Christmas. The Advent calendar and wreath serve as countdowns to Christmas Day and are an excellent and happy reminder of needed Christmas preparations with the added incentive of Christmas Candy. Advent is marked by a spirit of expectation, of anticipation, of preparation and of longing and for kids there is no better way to mark this time than with an advent calendar.